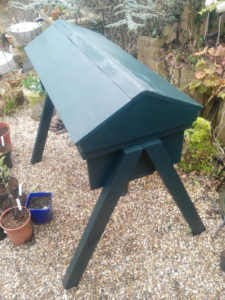 Following on from my earlier post about the making of our long hive, it now has inhabitants. I collected a swarm the other day. It was a fairly simple collection, hanging at head height in a tree. I knocked them into my skep and then waited whilst the stragglers and scout bees made their way back to the colony. There will always be a few left behind, but, providing you are prepared to be patient and you have the queen in the skep, the others will follow. 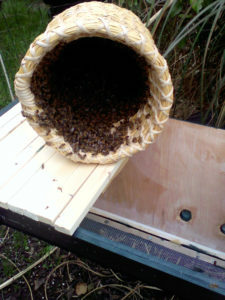 Here you can see them in the skep and then after being knocked into the hive. They quickly took to their new home and within a few hours had begun to draw out the small bits of wax foundation into comb. 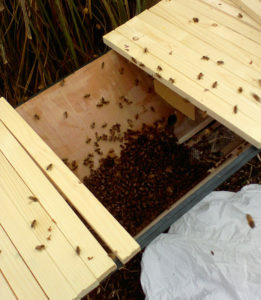 With any luck they will have time this year to pull the comb out sufficiently to give them space to put honey for their winter store. This will set them up for a strong 2018, when we might get some cut comb honey from them. 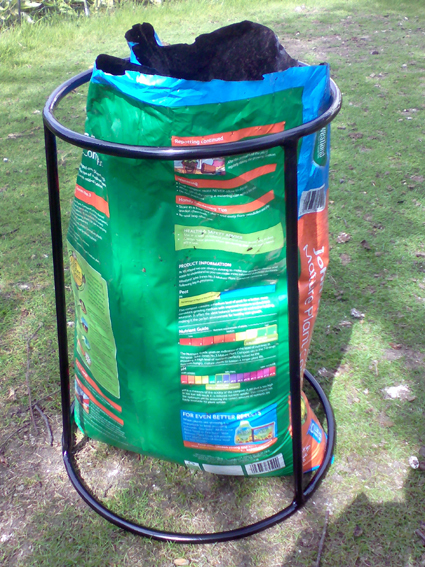 I was recently asked to help a friend out with a frame to both hold a compost bag and to give a frame to lean on whilst digging into the bag. Nothing too complicated, a large diameter ring for the base, 3 vertical rods and a smaller diameter ring at the top. This gives it extra stability. It’s the second one I have made, this one from 12mm steel to give it extra strength when leant on. Further to the Nunti I made, I was also asked to make another Nunti Bo, this time for Juan in Spain. I made one a few months ago for Garry. It is made from a Japanese Redwood Bo (shaft) with a forged steel end, finished simply with beeswax polish from our own bees. 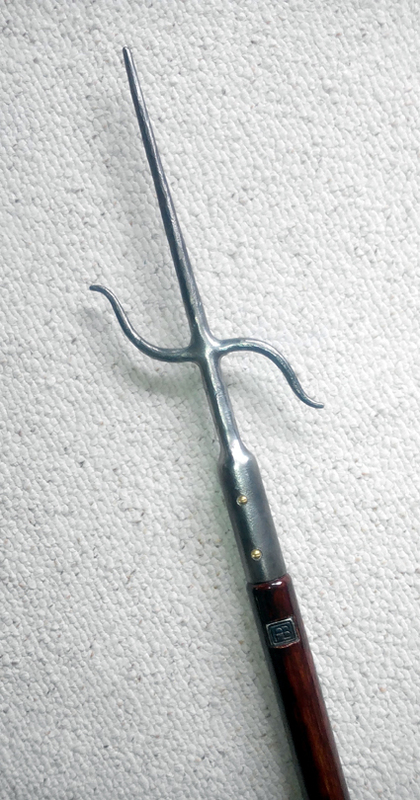 This is apparently based on a fisherman’s spear and now used in Okinawan martial arts. I am no martial arts expert, but I understand that it is composed of a Bo (the wooden shaft) with a Manji Sai mounted on one end.